Insurance News AXA Affin General has launched a PA product named SmartAid which charges normal rates for the visually impaired persons. SmartAid covers accidental death and TPD, medical expenses due to accident as well as funeral expenses. Insurance News HLTMT launched a 5-year capital protected plan named China Growth Income Plan (CGIP), sum covered is upto 125% of single contribution. Insurance News Consumers' Association of Penang wants to see a No Fault Liability insurance scheme to replace the current 3rd party motor insurance. The NFL scheme would run in a similar fashion as SOCSO. It is claimed to be more cost effective with lower management expenses, no lawyer fees and no commission to agents. Compensation would also be made faster. GEORGE TOWN: Imagine the trauma an accident victim or the beneficiary goes through while waiting for the courts to decide on an insurance claim which could drag on for years. Insurance News The sale of Pacific Insurance is targeted to be completed by Oct 2010. Currently the 2 potential buyers are Great Eastern and Fairfax Asia. PACIFICMAS Bhd (4782) hopes to conclude the sale of its insurance arm by October this year to meet the deadline imposed by the regulator on parent Oversea-Chinese Banking Corporation Ltd (OCBC), says its top executive. 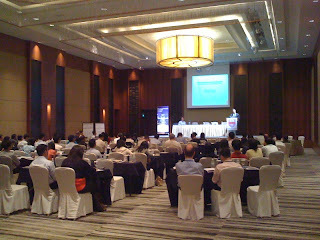 Insurance News MAA is targeting to complete the M&A deal by Q1 2011. There are a few potential partners, these are "foreign parties". The M&A deal would result in injection of capital to strengthen MAA's CAR. KUALA LUMPUR: MAA Holdings Bhd, which is on the lookout for merger and acquisitions (M&As) for its life insurance business, has a few potential suitors interested to buy a stake in the business, said chief executive officer and group managing director Muhamad Umar Swift. Insurance News Jerneh Asia and Paramount have submitted application to MOF via BNM for the approval to enter into agreement with a potential buyer for the disposal of Jerneh Insurance. The identity of the potential buyer is still not revealed at this stage. Any guesses? KUALA LUMPUR: Jerneh Asia Bhd has received Bank Negara's approval to start talks with certain parties with the aim of hiving off its insurance arm, Jerneh Insurance (M) Bhd. Insurance News Prudential has released the details of its rights issue: 11 news shares for every 2 held at 104 pence per share. LONDON: Britain's Prudential launched its US$21 billion rights issue on Monday, May 17, finally allowing the insurer to push ahead with its acquisition of AIG's Asian insurance business. Insurance News The revised TPBID scheme will go to Cabinet in July after BNM reflects the feedback from the public as deemed necessary. Insurance News Not quite clear on what Perwakim's proposal is, other than they are agreeable to RM2 mil cap; want premiums to remain unchanged while recognising that insurers are losing money by paying RM2.67 per RM1 premium; objecting to Newco jointly owned by government and insurers and upset that they were not consulted by BNM. PETALING JAYA: Insurance agents have proposed that the Government allow the reintroduction of third-party motor insurance scheme. Insurance News Prudential is likely to pull out of Australia, New Zealand, South Korea and Taiwan after its acquisition of AIA. Insurance News A very detailed history of OCA: 1) Merger of UOA and Capital in 2002. 2) Salcon, Usaha Tegas and a 3rd party interested to acquire OCA in 2007, deal did not materialise partly due to court injunction by Nesa Coop. 3) Some insights into operational issues faced by OCA in the recent years including inadequate HR and IT resources, poorly executed M&A and being put under watch list of BNM. Insurance News Bar Council has come up with its counter proposal for TPBID scheme. Features: 1) Revise the premiums that remain unchanged since 1978. 2) Maintain the current practice of letting courts decide on quantum of liability. 3) Shorten time period for claims by imposing time limits for obtaining documents from various parties & deadline for negotiations. 4) Regulate legal fees. 5) Fine-tune guidelines on quantum of awards. 6) Insurers to prepay part of claims monies to relieve claimant's hardship. 7) Address frauds and malpractices. PETALING JAYA: The Bar Council is against the Bank Negara Malaysia’s proposed new basic motor insurance and submitted a memorandum to the central bank Friday. Insurance News BNM has given approval to PacificMas to commence talks with Fairfax Asia on the disposal of Pacific Insurance. PacificMas is also currently in talks with Great Eastern Holdings. KUALA LUMPUR: PACIFICMAS BHD has received Bank Negara Malaysia's approval to start talks with Fairfax Asia Ltd to dispose of its insurance unit, The Pacific Insurance Bhd. Insurance News Prudential has finally got the approval from FSA. Insurance News If you intend to submit your feedback on the proposed TPBID scheme to BNM and have not done so, tomorrow is the last day to do so. PETALING JAYA: The Government is prepared to replace the third-party motor insurance with a new basic motor insurance, and the public has been urged to submit their feedback on the move to Bank Negara Malaysia by tomorrow. Insurance News G Team priced OCA at RM102 mil, which is close to 1.5 times of its book value. OCA will also be sold off within 1 year in compliance with BNM's requirements. KUALA LUMPUR: The offer price of 80 sen per Maika Holdings Bhd share made by G Team Resources & Holding Bhd is based on a book value of RM102mil for its main asset, Oriental Capital Assurance Bhd (OCA), as well as taking into account an assumed RM60mil liability at Maika itself. Insurance News ISM wants motor insurance premiums to be determined based on risk factors. Currently motor insurance in Malaysia is tariff-rated. KUALA LUMPUR: A risk-based approach to motor insurance and takaful is a more attractive proposition to commercial insurers as it will allow them to out-price their competitors, said ISM Insurance Services Malaysia Bhd chief executive officer (CEO) Carl Rajendran. Insurance News MCA suggests that insurers should use profits from comprehensive motor insurance (RM1.6 bil) to offset losses in 3rd party motor insurance (RM970 mil). Couldn't figure out how MCA got their figures, but BNM's 2009 statistics show that the claims ratio for motor insurance combined is 80%. With commission of 10% and management expense ratio of 23%, there is no profit for motor portfolio in total. ISM's statistics also show combined ratios of 292.4% and 91.4% for motor act and motor others respectively. Perhaps PIAM would want to go to press to confirm whether MCA is right that insurers still making money out of motor insurance? KUALA LUMPUR: Insurance companies should not increase third-party motor insurance premiums because it will burden the people, says MCA president Datuk Seri Dr Chua Soi Lek. Insurance News G Team, an SPV, is serving notice to take over Maika. Maika owns 74.16% of Oriental Capital Assurance. KUALA LUMPUR: CIMB Investment Bank Bhd has on behalf of G Team Resources & Holding Bhd (G Team) served a notice of take-over offer on the board of directors of Maika Holdings Bhd to acquire the 125 million voting shares in the company. Insurance News Summary of Kurnia's Q1 results: 1) Higher pre-tax profits due to lower management expenses 2) Lower post-tax profits due to disallowed expenses for taxation 3) Small decrease in revenue 4) Non-motor insurance constitutes 22% of total business compared with 17% a year ago. KUALA LUMPUR: Insurer KURNIA ASIA BHD's earnings fell 9.7% to RM23.81 million in the first quarter ended March 31, 2010 from RM26.39 million a year ago due to higher tax expenses. Insurance News PIDM will come up with an insurance compensation scheme that will protect insurance and takaful policyholders similar to the way bank depositors are protected. Currently all bank deposits are fully guaranteed by government. This was introduced 1 year plus ago during the financial crisis. The full guarantee will expire end of this year and the proposal is to increase the previous guarantee of RM60,000 to RM250,000. Presumably policyholders will also enjoy the same RM250,000 guarantee. KUALA LUMPUR: The government has proposed an insurance compensation scheme (ICS) for insurance and takaful policyholders, the Office of Minister of Finance said on Tuesday, May 11. THE competitive dynamics of the life insurance sector in Asia are much altered and insurers are being forced to rethink how and where they compete in the region. In order to prevail in the post-crisis era, they will have to take bold steps to increase market share and enhance profitability. Insurance News Prudential's CEO Tidjane Thiam is now facing pressure from some shareholders who called for his resignation over the delay in the takeover of AIA. Prudential Plc Chief Executive Officer Tidjane Thiam faces calls to resign from some of the company’s largest shareholders after setbacks with the acquisition of American International Group Inc.’s main Asian unit, The Sunday Telegraph reported . 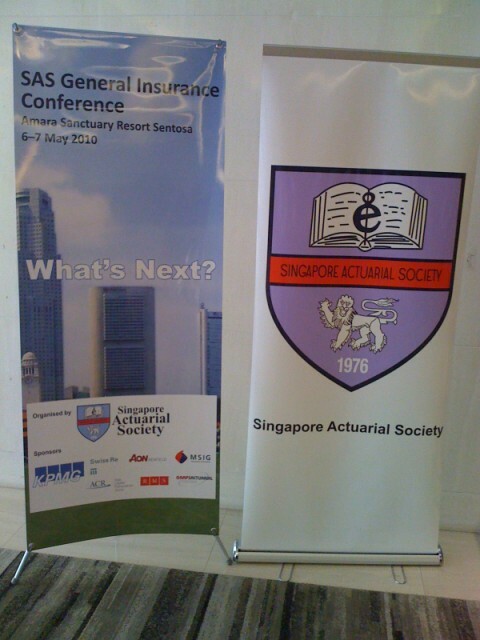 SAS' General Insurance Conference: "What's Next?" 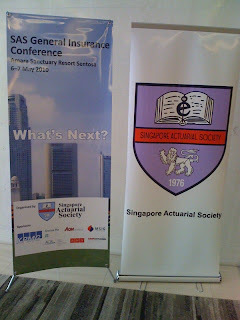 The Singapore Actuarial Society (SAS) organised its 2nd General Insurance Conference themed "What's Next?" 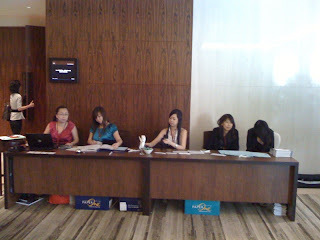 at Amara Sanctuary Sentosa from 6-7 May. The Conference attracted over 100 delegates from mainly Singapore and Malaysia and speakers from Singapore, Australia, Hong Kong, Taiwan, Canada and China. 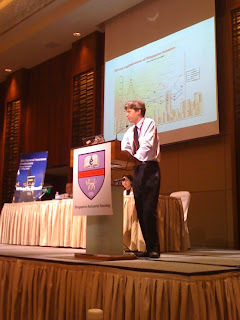 The 1 1/2 day conference discussed topics such as Singapore Stress Tests, Motor Insurance comparisons between Asia and North America, rating agency's capital model, professionalism, audit actuaries in general insurance, modelling catastrophe and terrorism, correlations between claims and premium liabilities, stochastic reserving etc. SAS will organise a 2 1/2-day Health Insurance Conference next month at the same venue. The brochure of the seminar can be downloaded from here. Insurance News The delay in Prudential's rights issue and acquisition of AIA will add further uncertainties to AIA's staff and agents. Will staff leave due to the uncertainties or will they now hope for the deal to fail? Wednesday's announcement may add to the possibility of defections by AIA's staff and self-employed agents. The Asian company has more than 300,000 sales agents in the region and is Hong Kong's largest life insurer, with a 16% market share. Insurance News BNM has advertised in several major newspapers inviting the public to provide feedback on TPBID. Insurance News I think it is misleading to say "Practitioners of actuarial science can calculate how long it takes before a skyscraper needs to be repainted, or how many cars will pass through a highway concessioners toll booth before the highway pays for itself." Most people who are mathematically trained should be able to do these, you don't need an actuary for these! Insurance News HSBC Amanah Takaful has set an internal target of contributing 20% to HSBC Amanah Malaysia's revenue by 2011. To achieve this target, it needs to double its gross contributions this year. Insurance News South Korean competition regulator has given the green light to Prudential to acquire AIA. It remains to see if Vietnamese authority would block the deal due to anti-trust. See our earlier post for background of this story. Insurance News MAA has received approval from BNM to take the necessary measures to meet the minimum CAR under RBC. This includes potential sale of MAA within 12 months from approval of BNM. Insurance News Tan Liling has been appointed COO for Prudential. She was previously CFO of HLA and ING. Insurance News With the commission ban on financial advice, the number of financial advisers in Australia is expected to reduce and the advisers will need to work harder. Financial advisers are however projected to earn more. THE cost of financial advice is set to fall under government plans to ban commissions on financial advice now built into managed funds and superannuation. Insurance News It is interesting to note that in UK, the entry age for Term Assurance is as high as 83 and for critical illness it is 74. In Malaysia, for most companies the corresponding figures are 65 and 60. Plenty of room to improve. But of course is there a strong demand at these ages given the relatively younger population here? Zurich UK Life has announced a range of new improvements to its mortgage and family protection proposition, aimed to appeal to a broad spectrum of advisers and their clients who want life and critical illness cover. Insurance News The integration exercise post Pru-AIA merger would be challenging with the rivalry of both camps. An exodus of senior executives is not ruled out post merger. British insurer Prudential will try to reassure investors it can seamlessly absorb the Asian arm of AIG next week when it publishes the prospectus for a record $21 billion cash call to fund the takeover. Insurance News Prudential's largest shareholder Capital Research & Management may not be supportive of the AIA deal and may prefer the break-up of Prudential which will bring more value. The rights issue requires 75% of the votes and may not be approved without the support of Capital. Insurance News Financial advisers in Australia will not be allowed to receive commissions in future to avoid conflicts of interest. The commission ban applies to retail investment products but does not cover risk products. SYDNEY:Australia announced sweeping changes to the financial planning industry yesterday, including the banning of commissions for advisers, in the wake of several high-profile corporate collapses. Insurance News BNM's proposed TPBID has received many complaints. http://bit.ly/9jTu40 BNM will assess the feedback. The revamped plan is targeted to be finalised by Q3 this year. Insurance News AirAsia has obtained licence to carry out captive insurance in Labuan. This provides flexibility in managing and retaining its risks in aviation, maritime and liability, which should result in lower costs to AirAsia. Insurance News Allianz's RM611 mil rights issue is to repay RM490 mil credit facility obtained in 2007 to purchase Commerce Assurance, to increase capital in Allianz Life and Allianz General and for the purpose of working capital. The share price of Allianz fell after the announcement of rights issue. PETALING JAYA: Allianz Malaysia Bhd (AMB) has proposed to sell irredeemable convertible preference shares (ICPS) to entitled shareholders under a plan to raise as much as RM611mil in fresh capital, the insurer told Bursa Malaysia yesterday.